I was born in Fort Kent, Maine on January 14th, 1965. On some day in my fourth or fifth year of life I picked up a pencil and started drawing. A lot. I began writing stories and poems by the time I was six. I knew I’d grow up to be a poet/painter by theage of seven. I would be Picasso. Or Walt Whitman. I started playing music that year as well, a trumpet. Loud. Then Louder. I was Satchmo. I played, I wrote, I sketched. Somewhere in my twenty-first year I began playing guitar. I wrote my first song in that same year. I would be Bob Dylan. I was born to do what I do. I know that now. Writing songs. All of my genetic predispositions and the interplay of my childhood upon them have brought me here. I am now Ellis Paul. I didn’t end up being any of my childhood heroes. Like all of us. We become who we are. I’ve been running this cobblestone folksinger path for thirty years. I’m very proud to be here, continuing the process of collecting stories, turning them into music and bringing them as songs to you. The Storyteller’s Suitcase is my next collection of songs. This is the album’s fundraising campaign. It will hire musicians, rent a studio, buy photos and designs and put them together in a beautiful timeless cd/book package. It will hire promoters, find radio stations, streaming providers, create music videos, and work its way across the internet and then into the hands of friends like you and strangers from around the globe. It starts here. My goal is to have one thousand people to be personally involved with this project. The constantly changing music world demands that the majority of artists reach out to supporters to survive so they can continue being who they are. This is my third campaign for my music and I am grateful for the past support and for your support now. The details are on the website for the contribution levels and the included items. Lyrics, Art, Music. I’m still that five year old, scribbling on paper beneath a lamp on the floor. I am producing this project myself with my favorite musicians and co-writers from the American songwriter’s circuit. It will be recorded sparsely and intimately so the feel of my live shows is present in the music. The music will be a collection of stories I've gathered from around the country. 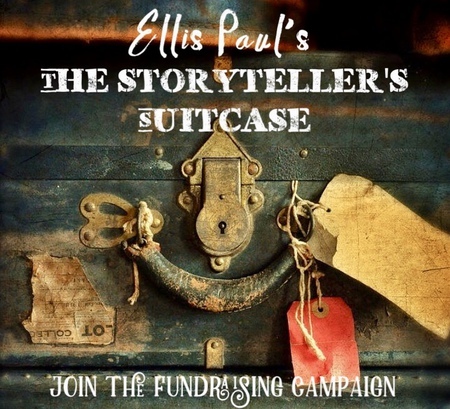 The Storyteller’s Suitcase will be an autobiography of songs. It's about love, heroes, and family across the decades of my life. In the past five years since my last album Chasing Beauty I’ve left a marriage, a business partnership, a booking agency. I’ve lost my voice and regained a new one. I’m looking at this project as a new start, after a few years of regrouping and healing. And, I'm thanking you, as always, for keeping me on this path. Digital download of "The Storyteller's Suitcase". An autographed copy of "The Storyteller's Suitcase" CD + the digital download. A Poster designed and signed by Ellis commemorating the creation of this album + all of the items above. A t-shirt commemorating the creation of this album + all of the items above. A tiny commemorative suitcase filled with mystery travel items + all of the items above. Silver version of the tiny travel suitcase, with extra items including USB of Ellis Travel Songs, two tickets to any show + all of the items above. Gold version of tiny travel suitcase, Ellis' entire catalogue on USB, hand-written lyrics to any song of your choice + all of the items above. Original artwork, 5 autographed copies of the CD + all of the items above. House concert in your home, a song written and recorded for you with voice and guitar, 10 autographed CDs + all of the items above.